At Radiators Plus, we use only use the finest Australian quality intercooler cores to ensure our customers get the very best performance from their motors. We find that many factory intercoolers crack as they age, leaking oil over the intercooler losing efficiency and power, which over time, can also shorten the engine life. We often re-core units if they have cast alloy tanks, O-ring seals and tabbed header plates. We also chemically clean your tanks and then TIG weld them to the new core. Where plastic tanks are used, we can fabricate new alloy tanks in their place and we have a large range of replacement ready-to-go O.E. Spec. complete intercoolers for most factory vehicles. Looking for a full custom upgrade? We can fabricate a complete new intercooler package including alloy tubing, mounting brackets, silicone hose, etc. and fit it to your vehicle. Some, but not all, intercoolers can be repaired. For example, we often see truck intercoolers with cracked tanks which we can clean up and TIG weld if the damage isn’t too severe. Another problem we regularly see is tube to header leaks, which if severe, will need to be blanked off and welded. However, if the damage isn’t too serious, the tube to header can be bead blasted and epoxied up. When Radiators Plus works on your intercooler, the service includes a full chemical clean to remove any grime and oil residue, etc., plus we’ll fully test it to ensure it performs to the highest standards. 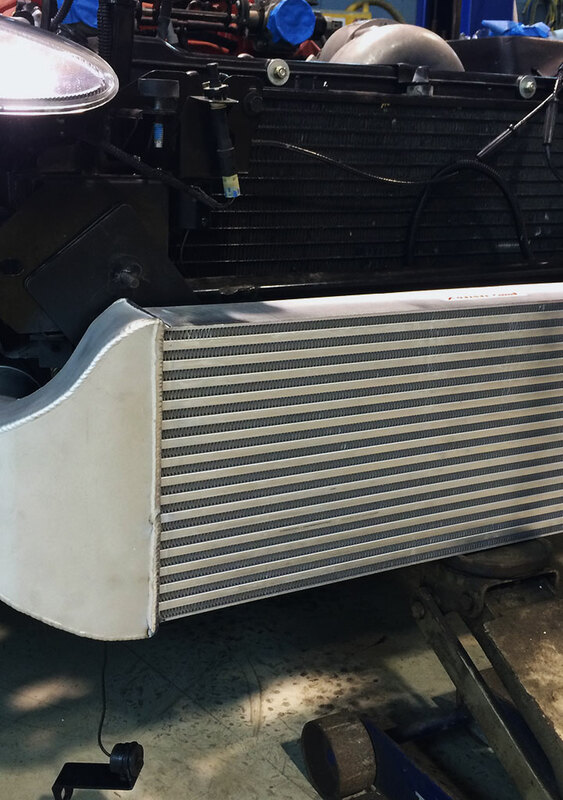 Radiators Plus specialise in water to air intercoolers which we manufacture in-house and custom fit to each individual vehicle. Water to air involves water going through a heat exchanger to cool the air intake charge from the turbo to the intake. The coolant is passed through a small radiator mounted normally in front of the original radiator via a 12 volt pump. It is a totally separate pressurised system. This is a highly efficient way of getting cold dense air, especially for 4WDs where minimal air intake from a front mount or top mount over the engine system can lead to heat sink from the motor. As much as 30 times more efficient than air to air, water to air intercoolers are a great choice for your vehicle. Get in touch with Andrew to find out more.